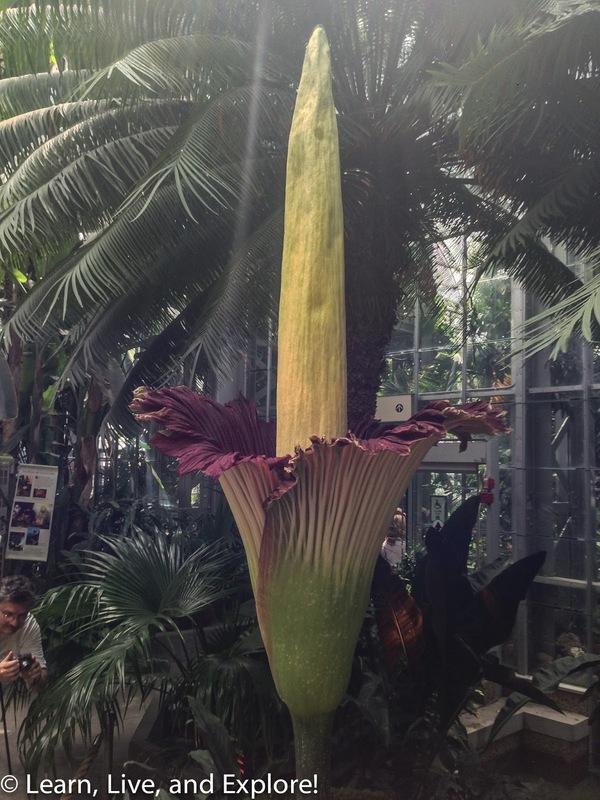 Weird D.C.: The Corpse Flower ~ Learn, Live, and Explore! 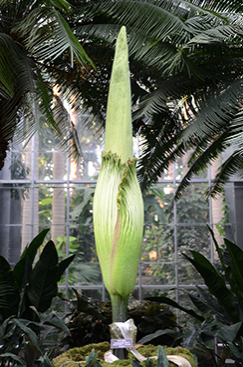 And in other (non-royal baby) news today, the U.S. Botanical Garden's "corpse flower" finally started to bloom on Sunday, one week after expected! If you have no idea what a corpse flower is, it's a very large (over 10 foot) plant native to Indonesia. 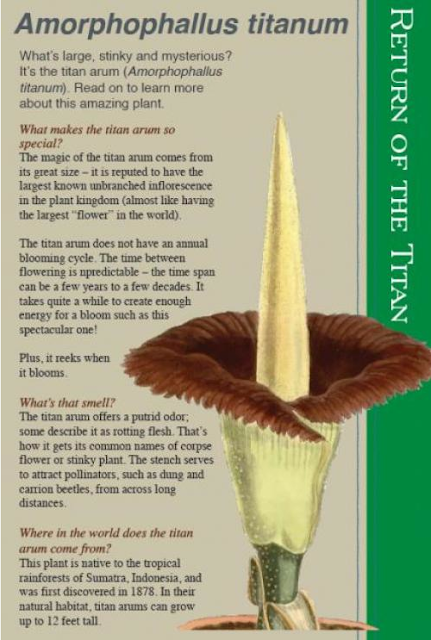 The nickname comes from the absolutely foul odor the bloom emits to attract pollenating insects. Some say it smells like rotting flesh. So, of course, this was Washington D.C.'s most popular attraction on Monday - as many visitors had been monitoring the live stream video for the indication to head into town. The blooming time is very limited, only 24-48 hours, and the line out the door of the normally quiet and low-trafficked building on the National Mall had hundreds of people anxiously waiting their turn - olfactory receptors anticipating the worst. Fortunately, the line moved quickly and it was just a 20 minute wait. 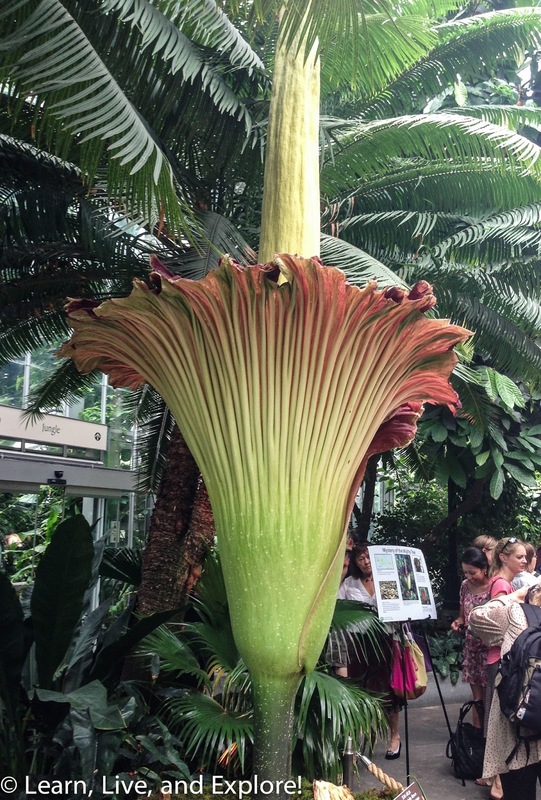 The U.S. Botanical Garden extended its hours to 8pm to allow the crowds a chance to see the bloom before it goes away. Alas, I did not get one key piece of information before determining the time I was going to head downtown to tackle the crowds - it is common for the atrocious scent to dissipate after 10 hours. When I finally got my turn, all I could smell was the that of wet greenery, like moss. Nothing bad. The last corpse flower to bloom in D.C. was in 2007, so I guess I will have to wait up to 6 years for my next chance to catch a whiff.